Chelsea full-back Bosingwa has thanked his new coach, Andre Villas Boas, for reviving his career. 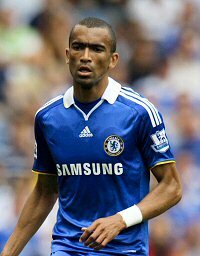 After making the move from Portuguese giants Porto to Chelsea after Euro 2008, Bosingwa initially impressed, easily winning a place in the starting eleven. In October of 2009, however, Bosingwa injured his knee, ruling him out for the rest of the season and of the World Cup. Upon his return, the right-back was not his usual attacking engine. He did receive playing time at Chelsea. He received enough to be called up for and play 90 minutes in Portugal’s 4-0 demolition of Spain. Bosingwa still didn’t look back to his best. After then Chelsea coach Carlo Ancelotti was replaced by Andre Villas Boas this summer, Bosingwa has seen a resurgence in his career, putting in some displays early in this season that suggest that the old Bosingwa is back. “The manager is important because he believes in me. If I don’t train well he won’t pick me to play but he has been very good for me because he trusts in me and is picking me,” Bosingwa said to the London Evening Standard.